SALT. 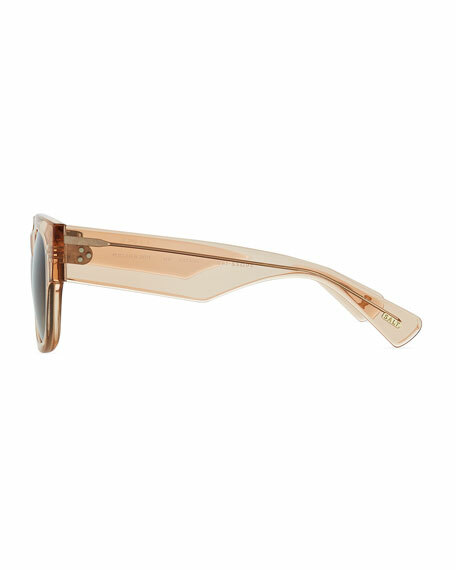 "Tavita" square sunglasses in acetate. Stud design at frame front and temples. Born on the Southern California coast in 2006, SALT. combines the best of custom materials and Japanese craftsmanship to produce the finest in premium eyewear. Handcrafted with precision and detail, the optical and sun collections showcase a meticulous, yet minimalist, design. Each pair of SALT's sunglasses feature polarized lenses with an anti-reflective exterior and an inner flash mirror coating, reducing overall brightness. The brand draws its inspiration for all seasonal collections from Nature's effortless beautythe Sea, the Air, the Landand their Timeless connection. For in-store inquiries, use sku #2433899.